A supporter of Assad holds a Hezbollah flag in Damascus, 15 May 2008. Photo by Khaled al-Hariri, Reuters, via Newsweek. Last week, UK MPs debated a call for all of Hezbollah to be banned by the UK. At the moment, the UK government makes a distinction between military and political parts of Hezbollah, proscribing only those parts it recognises to be clearly military. The debate was spurred by a call from London’s mayor Sadiq Khan for Hezbollah to be completely banned after complaints to him about Hezbollah supporters openly parading in London with the Hezbollah flag. That this House believes that Hezbollah is a terrorist organisation driven by an antisemitic ideology that seeks the destruction of Israel; notes that Hezbollah declares itself to be one organisation without distinguishable political or military wings; is concerned that the military wing of that organisation is proscribed, but its political wing is not; and calls on the Government to include Hezbollah in its entirety on the list of proscribed organisations. Syria Solidarity UK felt that Hezbollah’s current extensive crimes against Syrian civilians should instead be our most urgent concern, and in the days prior to the debate, we sent a detailed briefing to MPs across the House of Commons on Hezbollah’s attacks on Syrian civilians. View and download a PDF version of the briefing. Despite our briefing, MPs gave relatively little attention to Syria in their debate. Read the 25 January 2018 House of Commons debate on Hezbollah. In the debate, MPs made 106 mentions of Israel, 61 mentions of Lebanon, 38 mentions of Iran, and just 13 brief mentions of Syria. UK MPs seemed more interested in talking about Hezbollah flags than about Syrian civilians under attack by Hezbollah. There were 36 mentions of flags in the debate, compared to the 13 mentions of Syria. Below is the full text of our briefing. PDF here. On 25 January, the House of Commons is to debate a full ban on Hezbollah as a terrorist organisation. MPs are expected to focus on Hezbollah’s potential future threat to Israel, but Syria Solidarity UK believes that Hezbollah’s current extensive crimes against Syrian civilians should instead be our most urgent concern. Hezbollah is directly responsible for besieging and forcibly displacing several civilian communities, blocking food and medical aid, and killing civilians. Hezbollah took part in forcing the mass displacement of hundreds of thousands of civilians from the city of Aleppo and from Madaya, Zabadani, Wadi Barada, and other communities. Syrian children in Madaya suffered injury and death by starvation, land mines, and sniper fire, at the hands of Hezbollah. The failure of British MPs to protect civilians in Syria has allowed the Assad regime and its allies to go on killing for near seven years; it has also allowed Hezbollah to expand, increased the threat of terrorism, and worsened the refugee crisis. A full ban on Hezbollah by the UK would be welcome if it helped constrain Hezbollah criminality against Syrians, but what we really need from UK Members of Parliament is effective action NOW to protect civilians in Syria. Hezbollah is a Lebanese Shia Islamist military and political organisation formed in 1982 and backed by the Islamic Republic of Iran and Syria’s Assad regime. Hezbollah was initially defined as a resistance movement against Israel’s presence in Lebanon up to 2000. Hezbollah’s last major conflict with Israel was in 2006. On 14 February 2005 Rafic Hariri, Lebanon’s former Prime Minister, was killed along with 21 others in an explosion in Beirut. The Special Tribunal for Lebanon, established in 2007 by the UN Security Council, is trying three accused in absentia, including Salim Ayyash, Hezbollah’s southern military commander. A fourth accused, Mustafa Amine Badreddine, was reported killed on 11 May 2016 in an attack in Damascus, Syria. He had been responsible for Hezbollah’s military operations in Syria since 2011. The 2005 killing of Rafic Hariri led to the Cedar Revolution: popular protests that ended the 35-year occupation of Lebanon by Syria’s Assad regime, Hezbollah’s ally. Since then however, Hezbollah’s political power in Lebanon has increased. In 2016, Lebanon’s parliament elected Hezbollah ally Michel Aoun as president, and parliament swore in a new cabinet dominated by Hezbollah and its partners. Hezbollah has used the Syrian war to bolster its influence in Lebanon’s sectarian political system, playing on Christian fears to build a new alliance. Central to this is opposition to Syrian refugee camps in Lebanon and active marginalisation of refugees. What is current UK policy towards Hezbollah? Hezbollah’s External Security Organisation was proscribed by the UK Government in March 2001 and in 2008 the proscription was extended to Hezbollah’s Military apparatus including the Jihad Council. The UK Government currently makes a distinction between proscribed military elements of Hezbollah and Hezbollah’s political representatives which are not proscribed by the UK Government. Why is Hezbollah fighting in Syria? Since 2012, Hezbollah has fought in Syria in support of the Assad regime against a popular uprising. To explain its shift from focusing on Israel, Hezbollah has justified its actions in Syria in sectarian terms as a defence of Shia shrines and Shia communities. Hezbollah is a client of the Islamic Republic of Iran and relies on arms from Iran supplied across the Lebanon-Syria border via the Assad regime. The Islamic Republic of Iran uses both Hezbollah and the Assad regime to project power across the region. Hezbollah forces have fought across Syria, to conquer opposition-held Aleppo city in 2016 and to establish control of a land route to Iraq in 2017, but their particular focus has been to gain control in areas adjacent to the Lebanese border, and along supply lines between the border and Syria’s capital Damascus. To do this they have enforced sieges against civilian communities and forced the displacement of civilians from their homes. What is Hezbollah accused of in Syria? The battle for the town of al-Qusayr in 2013 marked a turning point in Hezbollah’s involvement in Syria, and in the sectarian reshaping of areas along the Lebanese border. Al-Qusayr is located between the Lebanese border and Homs. Opposition forces in the town had resisted Assad’s military for over a year, but Hezbollah’s intervention proved overwhelming, taking Al-Qusayr within a couple of months and causing a large part of the prewar population of 30,000 to flee. The al-Qusayr area had a diverse population including Sunni, Shia, Alawites and Christians. Hezbollah justified their actions in sectarian terms, accusing rebels of threatening Shia residents of nearby villages. The defenders of al-Qusayr, numbering around 3,000, were primarily led by homegrown fighters, among them defectors from the Syrian military, reinforced in the last week of the battle by fighters from Homs and Aleppo, as well as around 200 Jabhat al-Nusra fighters. When Hezbollah took al-Qusayr on 5 June 2013, fleeing fighters and civilians came under mortar and machine gun fire. Survivors said people were shot around them as they ran. Many refugees ended up in Arsal, Lebanon. After al-Qusayr, Hezbollah and the Assad regime were able to take control of more border territory. The town of Tel Kalakh surrendered later in June 2013 after a two-year siege. In November 2013, Hezbollah and Assad regime forces attacked the towns of Nabak and Qara, driving more people across the border into Lebanon. In November 2016, Hezbollah staged a major display of military might in al-Qusayr. Pro-Hezbollah media said residents from Al-Qusayr and nearby towns were not present at the military parade ‘due to security concerns.’ Hezbollah’s continued grip on these areas makes it unsafe for very many refugees in Lebanon to return to their homes. 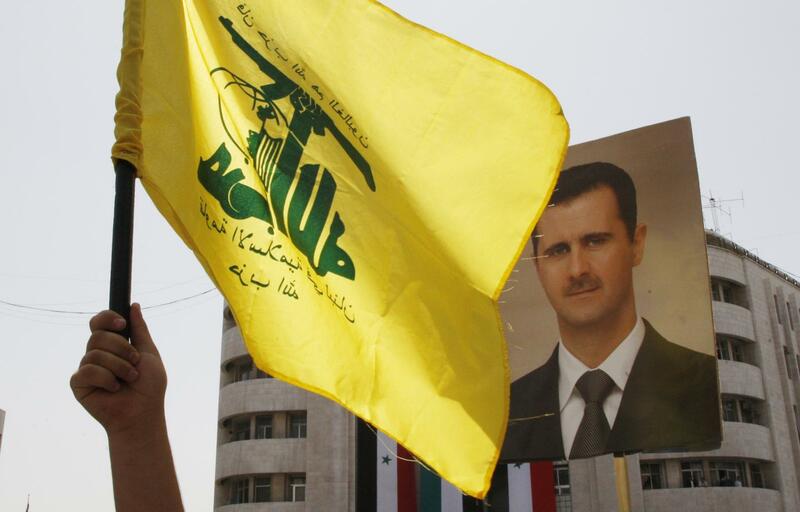 Hezbollah took part in several of the Assad regime’s ‘starve or surrender’ sieges of Syrian communities, particularly around Damascus and near the Lebanese border, as the group has sought to secure their supply lines between Damascus and Lebanon. The following information is drawn from the quarterly Siege Watch reports produced by the Netherlands peacebuilding organisation PAX and The Syria Institute in the US. In January 2016, activists in Madaya released photos and videos of children starving under Hezbollah siege. In the northwestern portion of Rural Damascus governorate, a number of communities including Madaya, Zabadani, al-Tal, Qudsayya, and al-Hameh, came under siege by the Syrian military and Hezbollah in July 2015. At that point Siege Watch estimated that 40,000 people were trapped in Madaya, about half of whom were people displaced by Hezbollah and the Assad regime from nearby Zabadani, and that 500 people remained trapped in Zabadani. Hezbollah used mines and snipers to stop civilians escaping. Hezbollah and its regime allies blocked food, blocked medical aid, and prevented medical evacuations. Hezbollah used deadly force to try and take control of Madaya’s water supply. Hezbollah burned land around Madaya to further isolate the town. The siege came to an end in March 2017 with the surrender of Madaya and Zabadani to pro Assad forces and the forced displacement of thousands of people to Idlib and northern Aleppo, over 200 kilometres away. Following removals, 28,230 people were estimated to live in Madaya compared to 41,000 during the siege, but the figure is uncertain due to the difficulty in getting information from post-surrender communities. 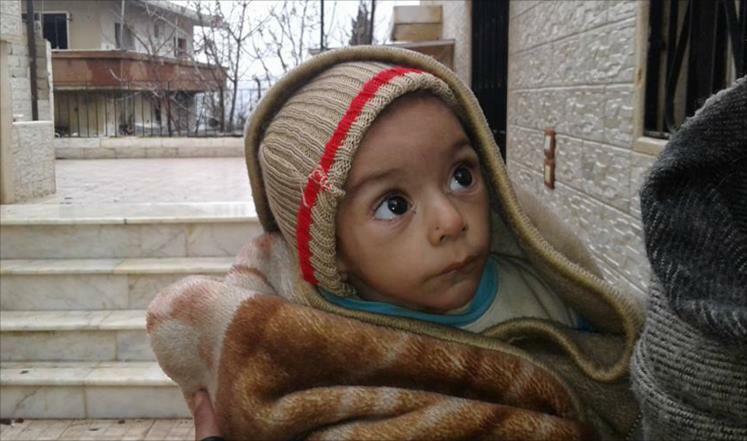 Starvation: By January 2016, siege conditions in Madaya and Zabadani were so severe that starvation was widespread. By 1 February 2016, there were approximately 76 siege-related deaths. International pressure led to some delivery of aid, but by July 2016 Siege Watch again reported deteriorating conditions, malnutrition-related illnesses rising, no humanitarian assistance allowed in, and medics lacking supplies, equipment, and trained staff. A number of suicides were reported in May-July 2016, and a number of civilians needing urgent medical care died as medical evacuations were denied. In May 2016 a 12-year old girl named Ola Murad died of acute malnutrition. Attacks on water supply: Violent attacks on Madaya and Zabadani were reported throughout May-July 2016, including several attempts by Hezbollah forces to take control of natural springs that feed water into the besieged towns. In August, Hezbollah forces again tried to capture the water springs. They were repelled by Ahrar al-Sham fighters, but an estimated five civilians were killed and seven were injured in the fighting. Forced displacement: There were periodic forced displacements of families around Madaya by besieging Hezbollah forces. For example, approximately 40 families were forcibly displaced and moved into the besieged area on 19 October 2016. The evictions were believed to be part of a demographic engineering strategy, securing border regions by replacing native populations with pro-Hezbollah and pro-Assad Shia populations. 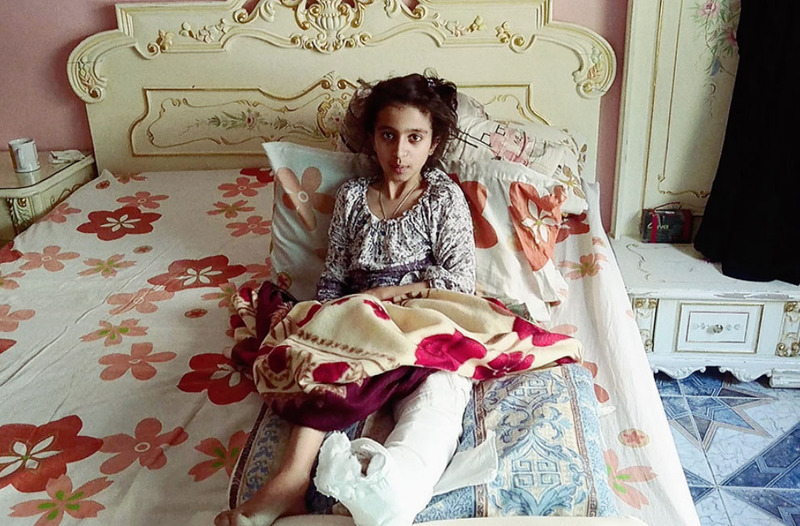 A nine-year-old girl shot by a Hezbollah sniper in Madaya, 10 August 2016. Snipers: In August-October 2016, Siege Watch reported increased civilian shootings by Hezbollah snipers. Snipers in buildings overlooking the town targeted anyone within range, including civilians. In early August 2016, a 9-year old girl was shot in the leg; the wound became infected and required medical evacuation. On 11 August, a 70-year old woman was shot and killed. Mourners at her funeral were also targeted by the snipers. Frequent reports of children being injured and even killed in sniper attacks continued into 2017. Hezbollah snipers at several checkpoints overlooking the city appeared to be literally targeting anything that moved, according to Siege Watch. Denial of healthcare: On 27 October 2016, the only remaining medical point in Madaya announced that it was ceasing all activities due to lack of supplies. The following day a 10-year old boy named Mohammad al-Maleh fell off of a roof, reportedly after being startled by the sound of a sniper, and incurred a critical head injury. He later died when he was denied evacuation for treatment. In addition to malnutrition, highly contagious bacterial meningitis was widespread and there were no infant vaccines available. A steady stream of deaths was reported throughout the November 2016-January 2017 period among vulnerable populations such as infants and people with chronic conditions. No medical evacuations were granted from Madaya during this period. On 15 February 2017, a woman named Sana Awad died along with her newborn from complications of childbirth due to the lack of available medical treatment. There were approximately 27 kidney failure patients trapped in Madaya at this time that were unable to receive dialysis treatment due to the lack of supplies. On 5 November 2016, the first of these patients, a man named Dibu Ibrahim Al-Kwayfi, died. On 10 November, a second kidney failure patient died, a 25-year old woman named Ola Mohammad Shabarek. Another kidney failure patient named Ali Ghasn was in critical condition at the end of the reporting period when the final dialysis treatments ran out. With only painkillers available for treatment he died on 6 February 2017. On 14 March 2017, Madaya and Zabadani were reached with an interagency UN/ICRC shipment of humanitarian aid containing food and medical supplies in return for a similar shipment reaching the government-controlled besieged areas of Fuaa and Kefraya in Idlib. The trucks intended for Madaya were delayed until 15 March 2017 at a Hezbollah checkpoint, where 16,143 medical treatments were removed from the aid trucks destined for Madaya, and 3,218 from the trucks destined for Zabadani. The day after the delivery, Hezbollah sniper fire aimed at the warehouse prevented distribution of the aid and killed and injured several people. Among those was a 15-year old boy who was shot in the face by a sniper. Although he survived for a day after his injury, he was not granted medical evacuation and he later died. In February 2016 Siege Watch reported that the al-Waer neighbourhood in Homs was besieged by Assad regime forces and by al-Ridha Shia militia, which is the core of the ‘Syrian Hezbollah’, Syrian militia formed by Hezbollah in early 2014. An estimated 95,000 people were trapped in al-Waer, very many of them forcibly displaced to al-Waer at the end of the Assad regime’s 2011-2014 siege of the Old City of Homs. On 20 February 2017, a UN interagency aid convoy destined for al-Waer failed to reach its destination. While en route it was fired at and looted by Hezbollah’s protégés, the Shia militia al-Ridha. Siege Watch contacts reported that 22 out of the 35 aid trucks were diverted by al-Ridha militia and offloaded in regime-controlled Mazraa area. On the brink of collapse, al-Waer surrendered to Assad regime terms on 13 March 2017. The deal was reportedly negotiated by Russian mediators who used similar threat tactics reportedly used by Syrian government negotiators in other localities, promising that the neighbourhood would be annihilated if it refused to surrender. The final agreement called for the forced transfer to Idlib and northern Aleppo province of somewhere between 12,000 to 20,000 people, more than two thirds of them civilians. In July 2016 Hezbollah cut access to the community of Wadi Barada, between Damascus and the Lebanese border. Just days before Wadi Barada was besieged, Hezbollah forces reportedly captured the town of Hurayra to its north, burning nearby farmland and forcibly displacing the citizens. Tens of thousands of people were living in the impacted Wadi Barada area, according to Siege Watch. On 20 December 2016 pro-Assad forces launched a major offensive in the area, including ground attacks by Hezbollah and intensive bombing by Assad regime aircraft. On 23 December 2016, barrel bombs hit the Ein el-Fijeh water facility in Wadi Barada, effectively cutting the flow of water to Damascus, sparking a water crisis in the region. Local government and opposition negotiators agreed to allow the entry of a maintenance team to repair the springs. On 14 January 2017, while the team was on the ground, Retired Major General Ahmad al Ghadban, the government’s main negotiator, was assassinated. Local sources believed Hezbollah forces were responsible for the killing. This raised the possibility that Hezbollah (and Iran) had more extreme objectives in the Wadi Barada area than some in the Assad regime. In January 2017, pro-Assad forces advanced into the Wadi Barada enclave, capturing the villages of Afra and Bassemah. On 28 January 2017 the remaining towns agreed to the Assad regime’s terms, and beginning on 29 January, several thousand people including civilians and fighters were transported to Idlib, over 200 kilometres away. In the months afterwards, displaced Siege Watch contacts that had relatives still in Wadi Barada suggested that while the siege had been lifted, conditions had not normalised. Remaining civilians were facing a campaign of harassment and abuse by pro-Assad forces, targeting the communities that fought hardest. The towns of Ein Fijeh and Bassema were largely destroyed. Residents were not allowed to return, homes were burned down, belongings looted, and properties destroyed. After this, several families bribed Hezbollah and National Defence Forces (NDF) in order to leave Wadi Barada. Militias reportedly targeted specific people and families, breaking into their homes and burning down fruit trees, restaurants, shops, and other economic resources as a way to force more people to leave Wadi Barada. By mid-April 2017, pro-Assad forces had detained an estimated 45-50 people who were related to fighters that had earlier been deported to Idlib. The Assad regime used the detainees as hostages, demanding that their family members in Idlib turn themselves in to pro-government forces. According to the May 2016 Siege Watch report, Hezbollah joined Assad regime forces in violating the February 2016 Cessation of Hostilities with an offensive to take territory in the southern sector of besieged Eastern Ghouta in the suburbs of Damascus. By the beginning of May 2016, as many as half of the remaining residents of the area had fled to other parts of Eastern Ghouta. At that point Siege Watch estimated the besieged population in Eastern Ghouta to number over 418,475 people. The Eastern Ghouta siege is still ongoing, with daily attacks on civilians by pro-Assad forces. During the joint Russian/Iranian/Assad regime assault on eastern Aleppo city in 2016, Hezbollah operated in close coordination with Russian forces. Hezbollah were given air support by the Russian Air Force and acted as target spotters for Russian air attacks. Russian special forces fought alongside Hezbollah fighters. During the assault, Russian and Assad regime aircraft repeatedly made targeted strikes on civilian targets such as hospitals, some of which were hit several times over. Almost 3,500 civilians were reportedly killed by military action in Aleppo city between June and December 2016. During the evacuation of east Aleppo, Hezbollah detained buses and shot at civilians to exert pressure for a parallel evacuation from the regime-held towns of Foua and Kafrya, besieged by opposition armed groups in Idlib. More than 111,000 people registered as Internally Displaced People (IDPs) following the evacuation of east Aleppo. The failure of the UK government and UK MPs to agree effective action to limit the killing in Syria and protect civilians has allowed the growth of a number of extremist groups. All of these groups, whether presenting themselves as pro or anti Assad, have fought against moderate Syrian opposition forces. All have inflicted abuses on civilians. Some extremist groups such as Jabhat al Nusra and ISIS grew out of Al Qaeda in Iraq which received backing from the Assad regime between 2003 and 2010, but entered the Syrian war ostensibly opposed to Assad. Others fight on the side of the Assad regime, such as Hezbollah and other Iranian-led Shia militia groups of fighters from Iraq, Afghanistan, and elsewhere. A policy to support building a substantial moderate opposition force under a unified command could have prevented the rise of ISIS and other jihadist groups in 2013 and 2014; could have more effectively countered the sectarianisation of the conflict by Assad regime allies Hezbollah and Iran; and could have resisted Hezbollah’s sieges and forced displacements of civilian populations. Instead UK MPs argued against supporting moderate Free Syrian Army forces in 2013 at the very time they were coming under attack from ISIS, and at the same time as Iran was escalating its support for the Assad regime. The blocking of any action to protect civilians inside Syria by the UK Parliament in August 2013 made clear to the Assad regime and its allies Hezbollah and Iran that they had a green light to commit further atrocities. The use of sieges against civilians by pro-Assad forces including Hezbollah escalated after the West’s failure to take action in 2013, as did the use of air attacks against civilian areas. In December 2015, Parliament voted to take military action in Syria, but only against one extremist group, ignoring all others, ignoring the leading perpetrator of crimes against civilians, and with no commitment to protect civilians in Syria. From that point on the UK was engaged in the same airspace that the Assad regime was flying in; the same airspace used by Iranian supply flights to support its clients in Syria, including Hezbollah. The UK and its allies could have used military deterrence to clear the skies of Assad’s bombers. The UK could have begun humanitarian aid airdrops to communities besieged by Hezbollah and Assad. The UK did neither, and sieges, bombings, and forced displacements continued, with Hezbollah hardening its control of territory around the Lebanese border. During 2016-2017 the UK helped the US in training Syrian opposition forces in southern Syria, based in Tanf on the border with Jordan. These forces successfully cleared ISIS from a large area of the Syrian desert, but Hezbollah and other pro-Assad militias were then allowed to take the territory after ISIS had been removed. The US limited its air support to a 55 kilometre deconfliction zone around Tanf, negotiated with Russia. Failure to defend the wider territory taken from ISIS meant that Hezbollah had a free hand to advance towards establishing an overland supply route from Iran via Iraq. Idlib: Both Lebanese Hezbollah and Syrian Hezbollah forces are taking part in the current pro-Assad military campaign in Idlib. Russian and Assad regime air attacks have targeted populated areas and hospitals. According to the UN OCHA, these attacks displaced 212,140 people in Idlib in the month to 16 January 2018. Idlib’s population has risen to over two million, including 700,000 displaced people. Aggression by Hezbollah and pro-Assad forces now threatens even greater disaster. Eastern Ghouta: Hezbollah and Syrian militias trained by Hezbollah have taken part in the ongoing siege against communities in Eastern Ghouta. 400,000 people are under threat of death, injury, and forced displacement if the siege is allowed to continue. Daraa: Syria’s southern de-escalation zone, negotiated between the US, Jordan, and Russia, is thought to be more secure than the other de-escalation zones negotiated at Astana between Turkey, Iran, and Russia. However, while not being targeted by air strikes, the Daraa area has been targeted by increasingly sophisticated IEDs. Local residents and opposition figures now fear more overt hostilities by pro-Assad forces, including Hezbollah, who are deploying in greater numbers near the area. Daraa’s capital city was once home to some 150,000 people. While some thousands returned in recent months, many more remain displaced, a great number of them in Jordan. Return will be impossible for most as long as the threat of covert or overt violence from Hezbollah and other pro-Assad forces continues. Hezbollah’s offspring: Lebanese Hezbollah has spent years training Syrian militias to support the Assad regime. These can extend Hezbollah’s influence in Syria, even if Hezbollah itself is constrained. Quwat al-Ridha, estimated to be 3,500 fighters by is reported to be the core nucleus for Hezbollah in Syria, operating under the leadership and supervision of Hezbollah in Lebanon. Maan Talaa of the Omran Center for Strategic Studies reports other Syrian groups directly linked to Hezbollah to be Liwaa al-Imam al-Mehdi (2,000 fighters and mostly Alawites) and Assad Allah Ghaleb. Many other pro-Assad groups partner with Hezbollah and Iran, with Iran bankrolling them while Hezbollah provides training. Thousands have been trained across Syria, with 10,000 trained in Qusayr alone, the largest training facility for Hezbollah on the border with Lebanon, according to a report by Mona Alami. Hezbollah’s role in training Syrian militias is part of a wider regional picture, according to a report by Colin Clarke and Phillip Smyth. The wars in Syria and Iraq have given Iran the opportunity to use Hezbollah as a model elsewhere. Now militant groups across the region are undergoing a transformation into a Hezbollah-style organisation that is loyal to Iran and willing to fight alongside Iranian troops and advisers. The Syrian war became the impetus behind the growth of Iran’s transnational Shia foreign fighter network. Shia foreign fighters are already deployed in Syria, Iraq, and Yemen, and could also help Iran establish a greater presence in Afghanistan and Pakistan. Hezbollah and sectarianisation: The increased use of sectarianism by Hezbollah in its campaign in Syria is part of a bigger trend in the region and worldwide to instrumentalise and amplify sectarian and ethnic identities in pursuit of political aims. Some of the roots of Syria’s decades of dictatorship lie in the use of sectarianism in the colonial period of 1920-1945 to divide and dominate Syria. In opposing Hezbollah’s violence and oppression in Syria, the UK should also oppose any proposals to frame political outcomes in terms of sectarian or ethnic interests. MPs should oppose any tendency to pick sectarian or ethnic favourites in UK policy on Syria and the region. Syrians have shared interests as citizens, as individuals with rights, as women and men, as children and as elderly, as employees, consumers, traders and entrepreneurs. Where power is determined by sectarian identity married to force of arms, the population as a whole is blocked from pursuing shared interests in pursuit of peace, justice, and prosperity across sectarian and ethnic lines. Hezbollah has grown through the Assad regime’s reliance on violence to retain power, and its reliance on Iran for external military and financial support. Countering Hezbollah is inseparable from countering the Assad regime, and countering Iran’s export of violence. Hezbollah and all other pro-Assad forces are waging war against all parts of the civilian population that resist Assad’s rule. Syria’s civilians are at the centre of this conflict. As a state militarily engaged in Syria for over two years, as a permanent member of the UN Security Council, as a country with the economic and military and legal power to act, the UK has a neglected moral duty as well as a strategic interest in Syria. The UK must now actively protect civilians inside Syria, the primary victims of Hezbollah crimes. The UK must now act to constrain Iranian and Russian military, economic, and political support for both Hezbollah and Assad. Protecting Syria’s civilians would in turn allow them the possibility to exercise political power in their own country, and to resist the violent sectarianism of Hezbollah and Iran. Lebanon’s political leadership now includes Hezbollah and its allies, and the Lebanese government should be held accountable politically for Hezbollah’s actions in Syria. But while a full ban on Hezbollah may help in constraining economic and political support, it is far from the full measure of what is needed. Syrian organisations in the UK last year published a full set of proposals on how the UK can protect civilians in Syria. These proposals also include constraining Iranian and Russian military support, by sanctioning Iranian airlines used to supply Assad and Hezbollah via Damascus, and by identifying and sanctioning individual Russian officers and officials with command responsibility for war crimes and crimes against humanity. We urge all Members of Parliament to call for action now to protect civilians in Syria. Who are Hezbollah? BBC News, 4 July 2010. Mustafa Amine Badreddine biography by Trial International. Lebanon elects Christian Hezbollah ally Michel Aoun to help end political vacuum, Newsweek, 31 Oct 2016. Hezbollah’s latest conquest: Lebanon’s cabinet, Newsweek, 12 January 2017. How the Syrian civil war has transformed Hezbollah, The Nation, 30 March 2017. Proscribed terrorist organisations, Home Office, 22 December 2017. London Mayor ‘extremely disappointed’ as Home Secretary fails to ban Hezbollah, The JC, 2 October 2017. The Shiite jihad in Syria and its regional effects, Phillip Smyth, 2015. Syrian town of Qusair falls to Hezbollah in breakthrough for Assad, The Guardian, 5 June 2013. The battle for Qusayr: How the Syrian regime and Hizb Allah tipped the balance, N Blanford, 27 August 2013. New Syrian refugees descend on Lebanon, The New York Times, 16 November 2013. Hezbollah hosts large military parade in Syria’s Al-Qusayr, 13 November 2016. Iran repopulates Syria with Shia Muslims to help tighten regime’s control, The Guardian, 14 January 2017. Russia is Learning About Hezbollah, 11 January 2017. Breaking Aleppo, Atlantic Council, 13 February 2017. Deal reached that could restart Aleppo evacuation, AP, 17 December 2016. Report by the Secretariat to the All-Party Parliamentary Group Friends of Syria, 27 February 2017. Recent Developments in North-western Syria, UN OCHA, 16 January 2018. Syrian for Truth and Justice, 25 November 2017. Is the Syrian army preparing a renewed offensive on Daraa city? Syria Direct, 18 January 2018. Hezbollah is the real winner of the battle of Aleppo, Newsweek, 9 January 2017. Hezbollah embedded in Syria, Mona Alami, Atlantic Council, 2 March 2017. The implications of Iran’s expanding Shia foreign fighter network, Colin Clarke, Phillip Smyth, 27 Nov 2017. Protect Civilians, Together for Syria, August 2017.